Most things worked straight away, but I'm having trouble restoring the connection with a Powerware UPS, which is also the only device that uses SNMP v1 (all others use v3). I can ping the device from the PRTG server, and I receive SNMP traps from it, and SNMP traffic to other devices on the same network can traverse the firewall(s), but on this one device I get SNMP error # -2003 in both PRTG and the SNMP Tester software. I thought maybe it was because I was missing the Powerware MIBs on the new server, but even after re-importing them with the MIB Importer tool I still get the same error. I have also tried re-creating the device, but when trying to add the Powerware SNMP library sensor(s) it stays on Preparing sensor settings... for a long time and then gives the same error (2003). I've tried for hours to figure out what may be causing this and I'm not getting anywhere - any suggestions what else to try? I don't know the web interface of your UPC, so i can't give more than "lightweight Information", but i think this can't be the only configuration. I don't say that it is a misconfiguration on the IP-Interface itself (as shown on your screengrab), moreover the SNMP options. SNMP v1 & v2 is working with communities and these communities can be activated to an ip range (ex. 192.168.0.0/24 or 192.168.0.0/24 or also both together :) ) or only to one IP-Adress. If your "new" PRTG shouldn't have the same IP, than i think this is your Problem. Check your SNMP options in your UPC (theses one where you can edit the community). I think this is the problem. could it be that your new PRTG-Server is in a another network than the old one? Maybe not the same IP? Than it could be, that your configured Community on the UPS is only looking for one IP-Adress and not for a IP-Range. You said you got the error on both (PRTG and SNMP Tester), is the last one on the same server (your new PRTG)? 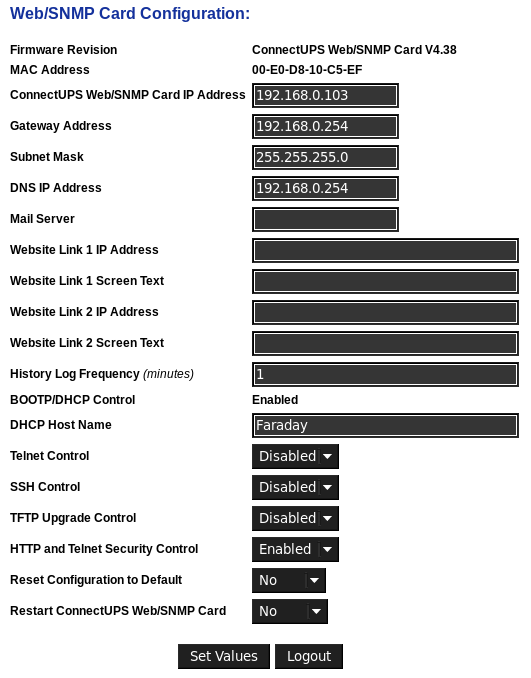 Please check the SNMP config of your UPS, maybe this could help you. If everything is right, text me here again. Thank you Sascha, you're correct. That means that PRTG didn't get any reply from the device, on some devices you can filter the IP addresses that can perform SNMP monitoring (as a security feature). This can lead to results like this when moving PRTG (and using a new IP address on the Server/Probe). I already read the "Checklist for SNMP Not Working" page, and I've tried temporarily disabling the firewall both on the PRTG server and the interconnecting router, with no change. Mysterious! Thanks Sascha, your answer made it clear that I had to dig deeper in the UPS config, so I enabled Telnet and after looking around in the menus I found the correct option. The IP address for read access was set to that of the old PRTG server - updating it to the new IP address gave PRTG access to the UPS. Annoyingly there is no provision for changing this through the web interface, which is what caused all the confusion; had I been presented with the option in the web UI I would have immediately understood it needed changing! Hello Lomax, Thank you for your feedback, it's great to hear that you got it working and thank you again Sascha for your assistance.